Employees are the foundation on which the previous and future success of TecAlliance is built. The results of a representative employee survey carried out in September 2015 demonstrated that TecAlliance meets the criteria of the TÜV MS Employee Satisfaction Standard regarding employee focus. Employee satisfaction is particularly important to the company as happy employees have the motivation required to work at the highest level. In collaboration with Professor Ottmar Braun from the University of Koblenz and Landau, who works in the field of the psychology of working attitudes and social behaviour, TÜV SÜD has developed instruments for the “Employee Satisfaction” Certificate by means of which the central drivers behind employee satisfaction can be examined through a range of subject areas. You can find more information about TecAlliance as an employer and our current job vacancies on the TecAlliance website. 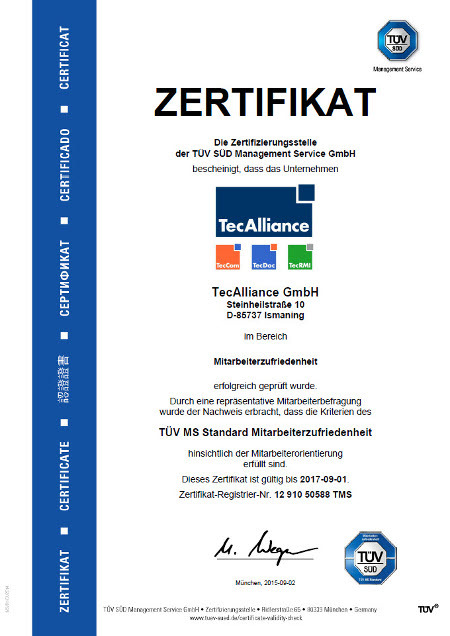 The TÜV SÜD certificate is evidence of the TecAlliance employees’ satisfaction with their employer.